Anasys Instruments, the world leader in nanoscale IR spectroscopy, is pleased to announce the nanoIR2-s™ nanoscale spectroscopy and imaging platform. The nanoIR2-s™ brings together two powerful techniques, AFM-IR and s-SNOM (scattering scanning near field optical microscopy). The AFM-IR is a proprietary Anasys technique that measures nanoscale IR absorption by using the AFM probe tip as a detector of IR absorption. Anasys Instruments’ AFM-IR technology is now routinely applied by industrial and academic researchers to study advanced polymers and life science specimens through direct IR absorption spectra at a spatial resolution unconstrained by optical diffraction limits of conventional infrared and Raman microscopy. Applications include polymer interface chemistry, subcellular imaging, protein secondary structure of single fibrils, and many more. 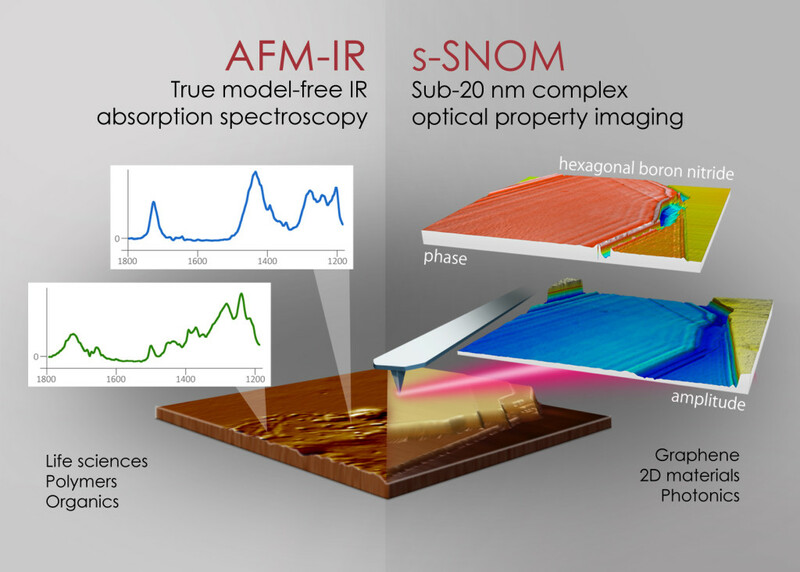 The s-SNOM is a well-established technique in the AFM field for sub-20nm optical imaging by studying the scattered light from a region of the sample under the AFM probe. The s-SNOM technique has recently been extended to the infrared and can provide complex optical property imaging of diverse materials, especially inorganics, 2D materials, micro/nanoelectronic devices, nano-antennas, and plasmonic structures. With several patented features, our nanoIR2-s delivers research productivity by providing adaptive beam steering, dynamic power control, and suppression of unwanted background to get fast, repeatable results. Our unique nano-thermal and nano-mechanical analysis capabilities, together with a robust AFM, make the nanoIR2s a multi-functional material property measurement platform. To view the details or download a brochure, visit https://www.anasysinstruments.com/nanoIR2s.